Connie Cooper of Saorsa Studio of Beads, lives in Plantersville, Texas, where she enjoys her passion of beading. She makes her own glass beads and also uses micro macrame with her beadwork. As she stated, "Macrame is my meditation." In working with glass, her favorite is what she calls "Organics" because she loves " watching the reactions and the innumerable ways the glass will behave." All of Connie's work is OOAK (One of a Kind), and she wants each person who buys a piece of her work to feel "as if they have something special and uniquely theirs." Her friend, Lauri Watson, got her started with beading, and recently she was accepted in to the Self Representing Artist Jewelry Designer (SRAJD) . 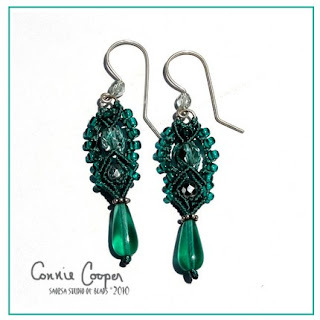 Connie thanks SRAJD for "promoting those of us who create and design jewelry as well). The green earrings are just beautiful! Nice post! I love those African Porcupine Quills! Great idea! And I am such a micro-macrame aficionada- love her color combinations. Thank you so much! I'm going to have to get one of you guys to write my bios for me. lol. You do a far superior job than I could ever dream of! What beautiful jewelry designs! Very nice post! Connie's creations are in a class all by themselves! Real standouts! Great post! I love her work!